They will be singing your praises when they receive this large basket filled with Gnocchi Artisan Pasta, Classic Fettuccine Handmade Pasta, Italian Pasta Salad, Extra Virgin Olive Oil, Roasted Portobello Mushroom Pasta Sauce with Pinot Noir Wine, Sun Dried Tomato & Herb Bread Dipper Seasoning Mix, Chardonnay Wine Biscuits with Italian Cheese, Melting Parmesan crunchy Sourdough Breadsticks, Focaccia Crisps Italian Crackers, Alfredo gourmet Pasta Sauce Blend, Vinyard Wine flavored Cheddar and a pasta sauce/linguini spoon. This beautiful collection of savory sauces, handcrafted pastas and delicious Italian snacks will make a wonderful gift for any occasion! 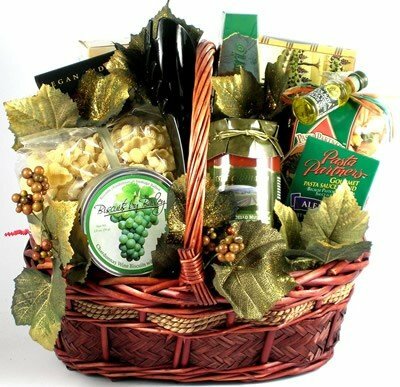 This beautiful specialty gourmet Italian gift basket makes the perfect gift for any occasion. Filled with a large selection of unique and delicious gourmet gifts, trimmed with Ivy and a designer bow and presented in a large handcrafted basket, what's not to love?